The free RadioPublic app makes it quick and easy for listeners to get to your show in any country. And with one universal link, your podcast is available for anyone on an Android or iPhone worldwide–and that’s only the start. Listeners automatically follow your show during the app install process, ensuring they get updates when you publish new episode with no delays. Listeners get to your show faster in RadioPublic. There’s no lost time setting up an account or social login before they can begin listening. We aid podcast listeners in exporting their shows from another podcast listening app over to RadioPublic with an easy to import/export OPML file. On the web, turn a casual visitor into a fan with your universal RadioPublic link and in the app, a curious podcast listener can just press play on an episode to get hooked. 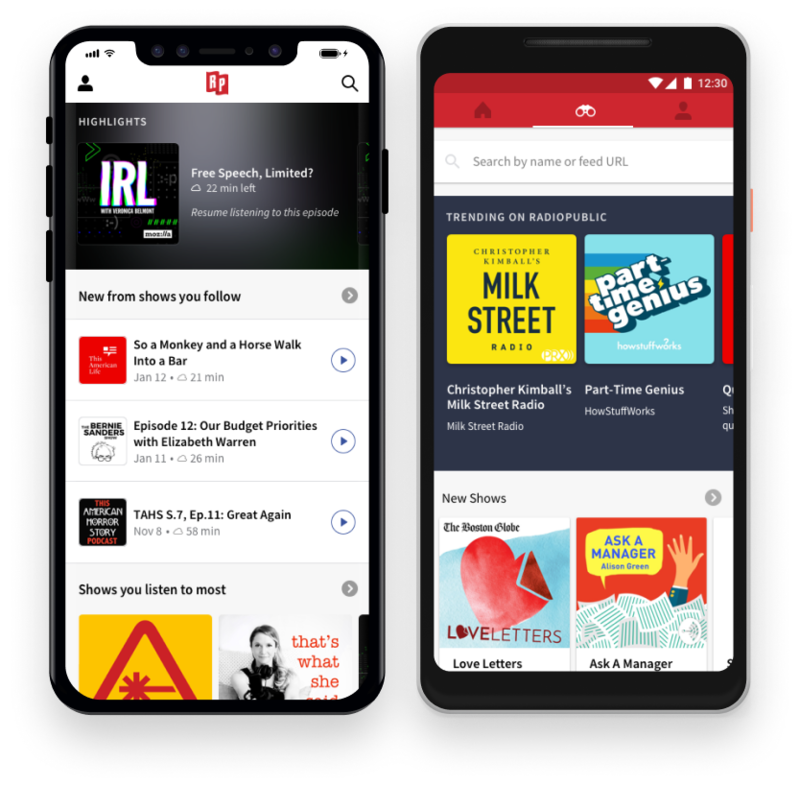 Once a listener is following your show, the app encourages continuous listening, resurfaces your show with Radio Mode, and offers reminders to revisit older, unheard, or unfinished episodes. Assure that all new podcast listeners know how to hear your podcast with this step-by-step How To Listen guide. We created app features that help you put your best foot forward for new listeners. Flag an episode or two you always want front and center. We display formatted show notes in full, including clickable links. Organize your seasons for quick listening access. Make a great first impression with your show’s teaser. Listeners can easily jump to key moments in an episode, preselected by you. Bookmark moments in an episode while listening to share with others. Sharing your show helps it grow: RadioPublic makes it easy to seamlessly share your podcast on the web and mobile. We also regularly surface shows through hand-curated editorial features and lean-back listening experiences. Share exactly the moment to start listening, via text, email, social media, or an embed player. Our Explore section highlights podcasts big and small, organized by how listeners are looking for them. Hand-picked episodes from podcast experts, our Podcast Librarian, and listeners like you. Choose a station by topic or time of day, then kick back to enjoy what comes up next from our hand-curated selections. Run out of episodes in your queue? We’ll suggest others for you to sample. RadioPublic recognizes that while podcasts are free to listeners, every podcast costs money to make. Break even (and earn more) with our revenue opportunities. Earn money every time someone hears an episode of your podcast on RadioPublic - $20 for every 1,000 listens, regardless of how many listeners you have. Target messages that reach the right listeners at the right moment. Receive one-time financial contributions from fans, right in the app. Test and measure the results of your promotional campaigns with marketing attribution links.